A science-gone-wrong monster epic from director Steven Spielberg and writer Michael Crichton, Jurassic Park boasts ground-breaking special effects but is an otherwise strangely dull, plotless and bordering on boring monsters-on-the-loose thriller. Eccentric tycoon John Hammond (Richard Attenborough) has created the Jurassic Park tourist destination filled with cloned dinosaurs on the tropical island paradise of Isla Nublar. Before the park opens to the public, a misbehaving dinosaur kills a worker, prompting investors represented by lawyer Donald Gennaro (Martin Ferrero) to insist on an expert independent safety audit. Paleontologist Dr. Alan Grant (Sam Neill), paleobotanist Dr. Ellie Sattler (Laura Dern) and chaos theorist Dr. Ian Malcolm (Jeff Goldblum) are recruited to inspect the site. Hammond's grandchildren Tim and Alexis drop by for a visit just as the experts start their work. The scientists are awed by the sight of recreated dinosaurs roaming the island within areas segregated by electrified fences. Hammond explains the cloning science, with the dinosaur DNA obtained from mosquitoes trapped for millennia in fossilized tree sap. But the park's weakness resides with disgruntled computer systems programmer Dennis Nedry (Wayne Knight), a slob of a man seeking greater financial rewards. When Dennis deactivates parts of the security system to steal dinosaur embryos, he sets off a series of events that allows the dinosaurs to roam free, placing the lives of the scientists and Hammond's grandchildren at risk. 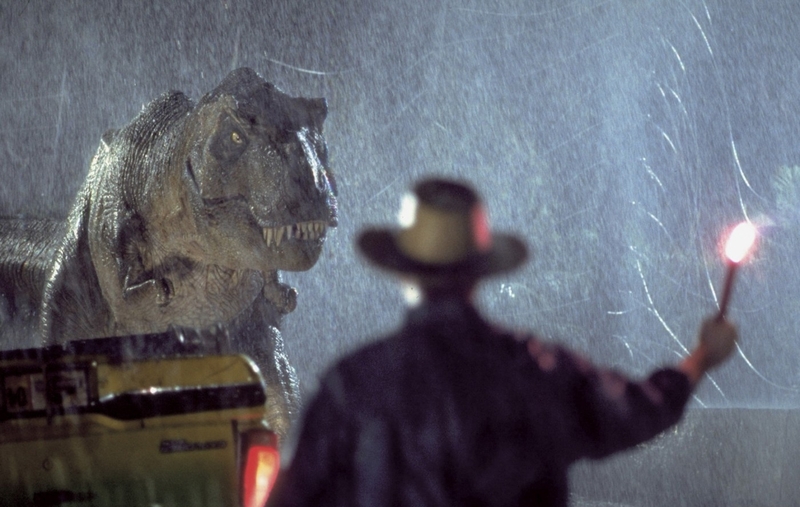 Jurassic Park is a visual treat, and by the standards of 1993, the special effects are magnificent. Spielberg brings assorted dinosaurs to realistic life, and watching the actors interact with the ancient beasts is a thrilling experience. At least, until the novelty wears off and the mind begins to wander towards the empty space where the non-existent narrative is supposed to reside. Crichton co-wrote the screenplay, and he brings his typical sloppy habits to the fore. The film has no meaningful human dimension, and the actors are left to grapple with plastic characters spouting stock phrases, while tiny, underdeveloped plot fragments are strewn all over the island. At the heart of the film's problems is the premise that all the security and computer systems of a multi-billion dollar investment can be entrusted to a single underpaid sloven like Dennis Nedry. The conspiracy to steal embryos is never more than a barely-baked idea to unleash chaos. Elsewhere, there is a tired sub-theme about Dr. Grant being intolerant of children, so of course he is saddled with saving the lives of young Tim and Alexis once the dinosaurs break out. Dr. Malcolm's chaos theories are presented as next to inexplicable, while Dr. Sattler starts down the road of exploring why a Triceratops is falling regularly ill, but that's another plot point that is summarily abandoned. Jurassic Park defaults to a series of well-executed set-pieces that nevertheless become irritatingly predictable: monsters attack, humans run for their lives. An endless sequence features a mammoth Tyrannosaurus Rex toying with the car in which Tim and Alexis are hiding. Later on, the vicious Velociraptors take their turn to hunt the humans, eventually cornering the kids in the kitchen. 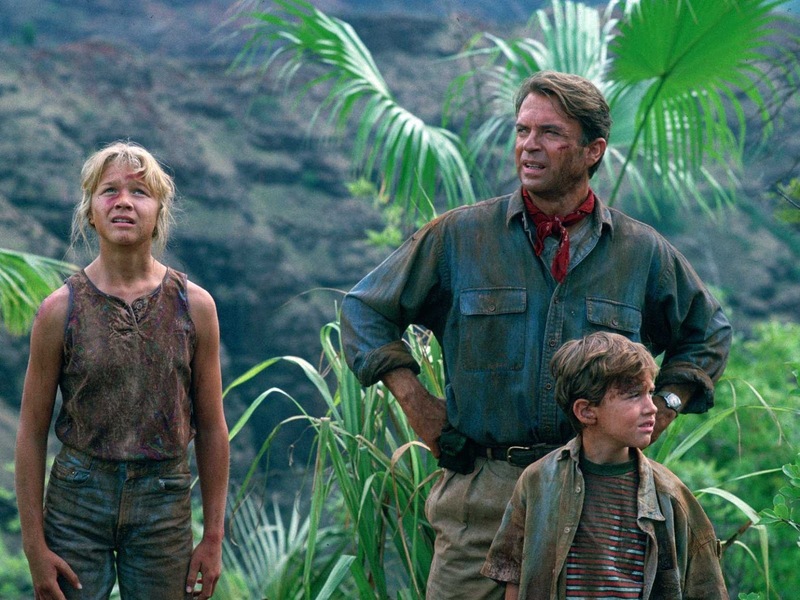 With Spielberg at the helm and the film heavily slanted towards the pre-teen demographic easily mesmerized by dinosaurs, there is never an actual risk that any character of consequence will actually get hurt, and all the violence is incongruously bloodless. It's innocent vanilla fun, a clash of creatures never intended to co-exist, and that's as deep as the themes of the film are allowed to go. Jurassic Park deserves recognition for raising the special effects bar and demonstrating what magic is possible with a combination of CGI and animatronics. But as a film it is a surprisingly soulless exercise in juvenile storytelling: two hours of screams, roars and not much substance.